Brits who are looking for a bargain on an autumn getaway may be in luck. With the end of summer, prices to travel to UK and European destinations have decreased by an average of 25%. The travel search engine Gopili analysed more than 80 million fares, across 460 companies, to determine the evolution of prices from one season to another. The study compared the average price, across all transportation modes, to travel between the two seasons for domestic and European journeys, three weeks in advance. 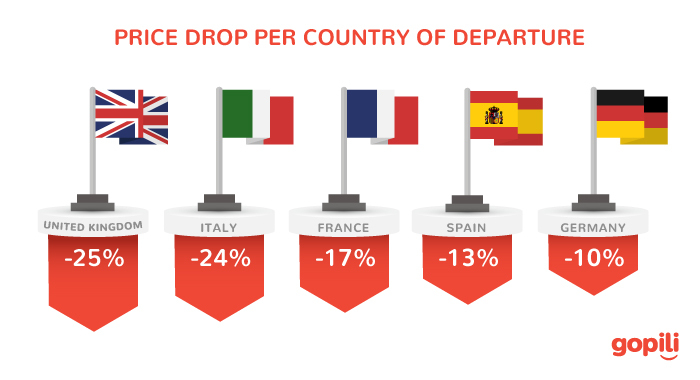 It reveals that fares from the UK have seen the largest decrease (-25%) comparing to other European countries: Italy (-24%), France (-17%), Spain (-13%) and Germany (-10%). While the average cost of domestic journeys decreased by -12%, fares from the UK to European destinations decreased by -28%. Barcelona (-64%), Madrid (-37%), Prague (-34%), Nice (-32%) and Venice (-28%) are the European top destinations experiencing the biggest price decreases from the UK. The study reveals a significant difference regarding the price drop per mode of transport. While airfare prices are on average 27% cheaper in autumn according to the data, the cost of ride share lifts do not tend to evolve a lot across the seasons (-6%). Train tickets cost 23% less and coach fares are 15% cheaper. Airfare prices larger decrease comparing to other modes does not mean it will be the cheapest option for autumn getaways. As an example, the average cost of flying from London to Amsterdam decreased by 45% (from £66 this summer to £36 this autumn) but it remains more expensive than taking the coach (£22 on average). Our travel search engine helps you compare all transportation modes for UK & European journeys and find the best option.